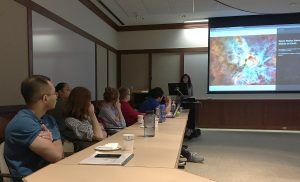 During the fall semester, 17 Wesleyan students collaborated with a community partner to create a geographic information system and conduct data analysis and visualization related to the community partner’s objectives. GIS is a computer system for capturing, storing and displaying data related to positions on Earth’s surface. The students, who are enrolled in the service-learning course E&ES 324 Introduction to GIS, presented their semester-long findings at a public presentation Dec. 8. “By partnering with a local group, the students are not only learning GIS skills, they’re also helping our community,” said the course’s instructor Kim Diver, assistant professor of the practice of earth and environmental sciences. Students learned about data collection, project management, editing, analysis and cartographic design. 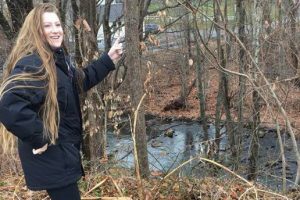 Annie Flom, Emily Hart, Jess Brennan and Riordan Abrams partnered with the Middlesex Land Trust to analyze the Sumner Brook Corridor for properties that should perhaps be protected. The students reviewed parcels both up and down stream to see how to protect the water corridor, the associated green-way and various ecosystems. While a previous GIS group has already worked on a project similar to this in Middletown, this group extended their analyses southward to the Durham/Guilford, Conn. boundary. The group created ranked overlays to determine what properties have higher scores based on their size, zoning and proximity to water. 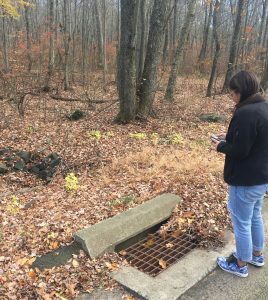 Eliza Carter, Ryan Nelson, Matt Forker and Natasha Nurjadin partnered with the Moodus Reservoir Preservation Group to locate and map all storm drains and catch basins using portable GPS location trackers on the roads surrounding the 250 acre southern border of Moodus Reservoir in Moodus, Conn. The team obtained the flow direction of these drains to see which drains, if any, led into the reservoir and mapped them. The students searched for any undocumented drains in the area that could be endangering the reservoir. Using the flow direction and location of storm drains, the ultimate goal of the project was to create a map to visualize which drains are flowing into the reservoir and are thus a source of pollutants and invasive species. Louisa Winchell and Matthew Shelly-Reade worked with the City of Middletown to create a map exploring the displacement of low income communities during Middletown’s 1959 waterfront redevelopment project. The City of Middletown lent the students a box of original aerial photos taken from 1922 that were scanned and georeferenced. “These aerial photos are likely the first in the U.S. taken of an urban environment specifically for land assessment purposes,” Diver said. The students tracked the development of low-income and public housing from the 1920s to the present day, and contextualized these locations with the downtown displacement of the 1950 and 60s. 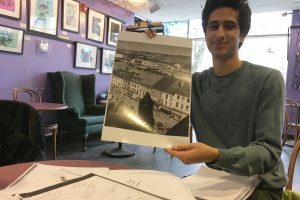 Corey Sobotka, Isaac Gould, Andrew Hyeon and Noah Spriggs also partnered with the City of Middletown to examine how land use has changed in a portion of Middletown. The group also used the ariel photos of Middletown and studied the forested and non-forested lands in the 1920s vs. today. 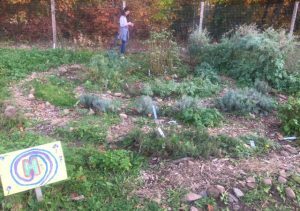 Hilary Brumberg, Katie Darr and Melissa McKee partnered with Long Lane Farm to create three maps. The maps included an artistic map including cultivating plots, hoop houses, slope crops, sheds, chicken coop and other permanent features; an interactive map with detailed, accurate depictions of all cultivated plots, beds and rows; and a soil analysis map showing trends in soil properties using a heat density map with graduated colors. The soil map, in particular, will draw from data in a soil science class at Wesleyan and include information on various soil properties, including pH, sand percent, C:N ratio, nutrient cations, grain size, color, depth, and nutrient improvement. In addition, earth and environmental sciences graduate student Jordyn-Marie Dudley developed a global catalog of meteorites by creating a map that displays the locations of all meteorite falls and finds. This map contains information on all of the different types of meteorites, but focuses on achondrites, the type she is analyzing for her thesis. Diver is offering an Advanced GIS and Spatial Analyses course (E&ES334) this spring and plans to teach this introductory course again next fall. Read more about the projects in this Hartford Courant article.